‘At headquarters she was a number’, at the local level… ‘she becomes an individual’. ‘She is no longer W.L.A. No. 657085, she is Betty or Madge’. Vita Sackville-West, ‘Women’s Land Army’, p.15. The transformation of a Land Girl from number to name would not have been possible without the significant administrative apparatus of the Women’s Land Army. The January post looked at the Women’s Land Army headquarters at Balcombe. 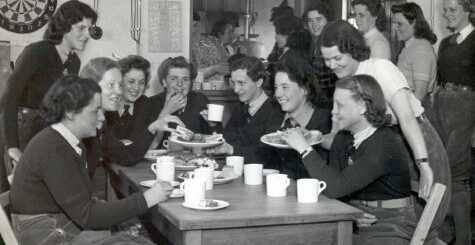 This post looks at how the national HQ connected with the Land Girl placed in counties around Britain. We look here at the different organisational roles within the WLA and what each of them entailed. 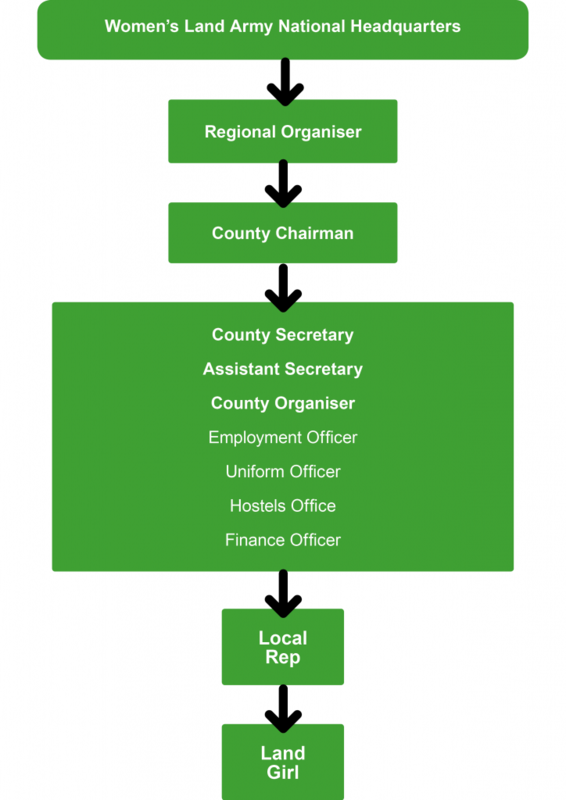 Regional Organiser: The Regional Organisers were paid administrators who linked the Headquarters with the County Offices. There were 7 regional officers, who held responsibility for several counties. They’d aim to visit a county for two days and then report back to Balcombe. They ensured that WLA policy was carried out, on issues from uniform and pay, to hostel accommodation and billet conditions. We now move down to the county level, where there was a WLA County Headquarters office. This office had a paid County Secretary, with assistants, and a county committee of unpaid advisers. For administrative purposes, larger counties were split into two, as was the case with Kent, Sussex, and Suffolk, where there were two offices. 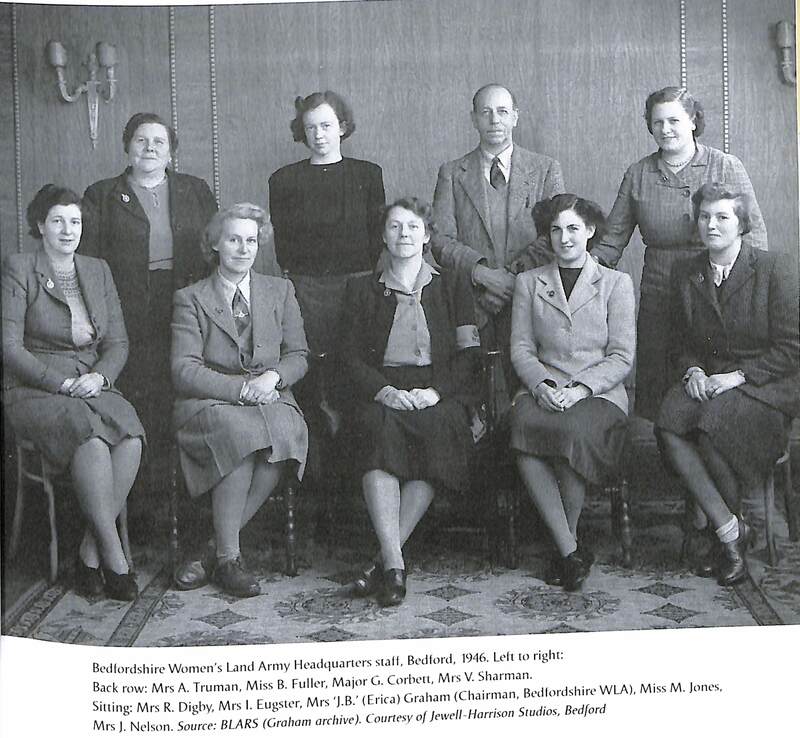 Members of the Norfolk WLA County Office at 7 Christchurch Road, Norwich in 1944. 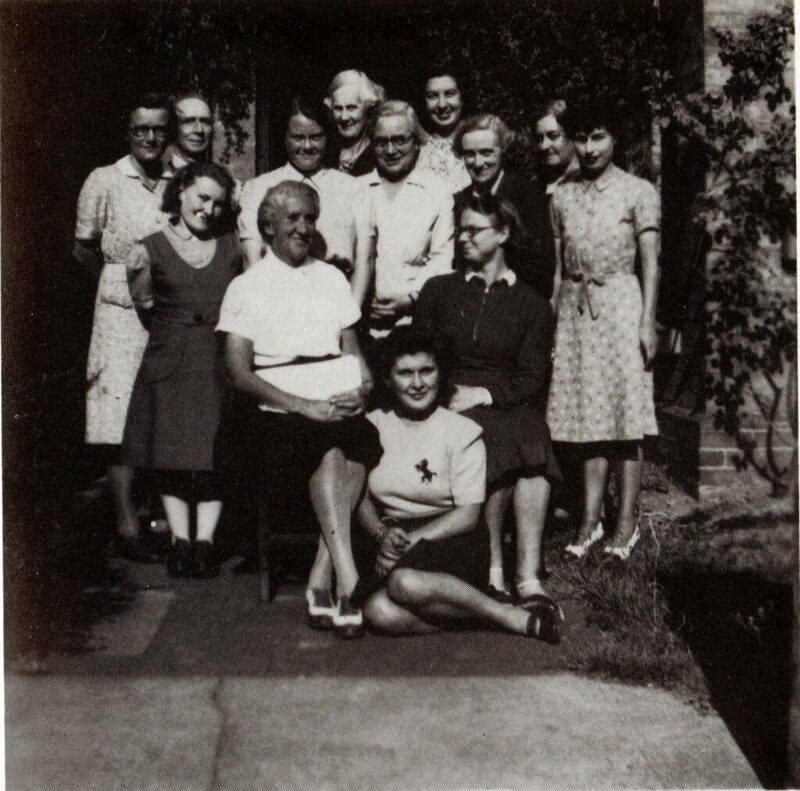 The lady sitting on the right is County Secretary Iris Tillet, the only woman to have written about her experiences in the role. Source: Cinderella Army, Iris Tillet, p. 25. The county committee had a Chairman and eight members, always women. 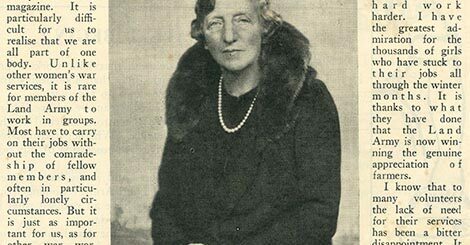 The female Chairman was selected by Lady Denman, from the networks and connections she had developed from her time as Chairman of the National Federation of Women’s Institutes. Lady Denman picked these individuals based on their status within the local area. Lady Denman needed these women to command respect from their fellow country male peers, at a time when some landowners and farmers were opposed to the idea of women working on the land. This was an unpaid position. All the following roles were salaried. County Secretary (Lincolnshire), and County Organiser (Derbyshire / Nottinghamshire). place them on farms or with War Agricultural Executive Committee mobile gangs. They also ensured ‘that all conditions of employment, such as wages, overtime-pay and sick-pay, holidays and days off, are properly adhered to’. The County Secretary would write to the WLA Headquarters with all the latest news from the county, so they could include it in Regional News section of The Land Girl journal. This role was not just office based; the County Secretary would also visit hostels and sit on several county committees. Marjorie Haigh, who was County Secretary for Derbyshire and Nottinghamshire from 1947 onwards. 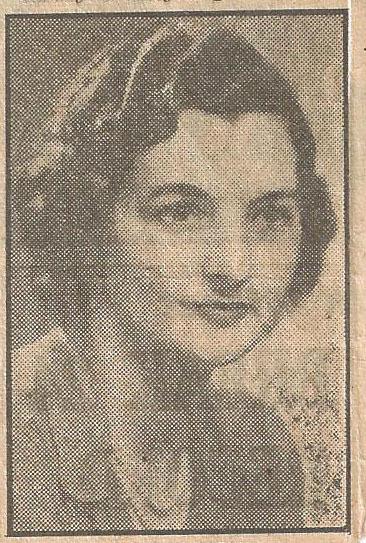 According to a newspaper article, ‘she was responsible for 15 Land Army administrative officers and arranged for the staffing and cooking of 30 hostels’. 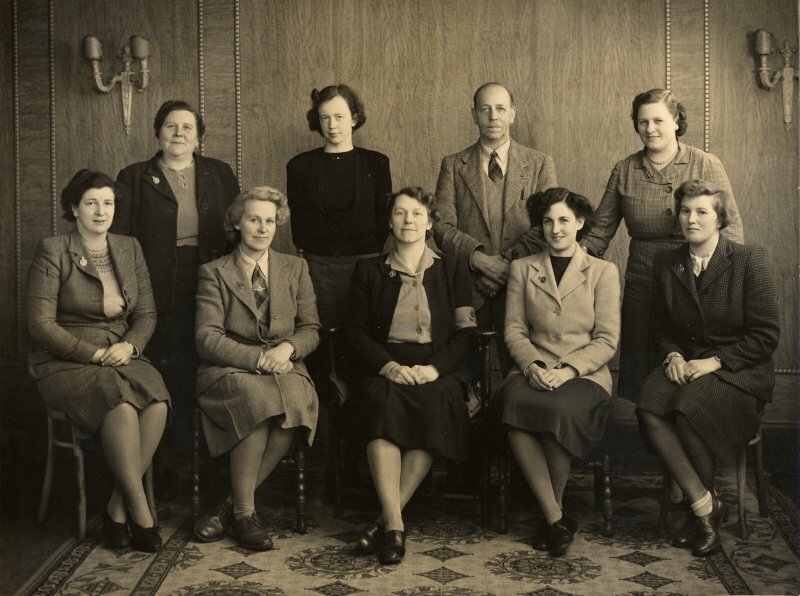 Members of the Bedfordshire Women’s Land Army County Office in 1946. For names of women in photo, please click here. Source: Stuart Antrobus ‘We Wouldn’t Have Missed It For The World’, p. 9. They also met some new Land Girls and helped them settle into a billet. County Organisers maintained relationships with the more local representatives (see below). Before becoming County Secretary, Marjorie Haigh worked the role of a County Organiser. She drove around 1000 miles a month, which saw her visit 2 hostels and 5 farms in just one day! 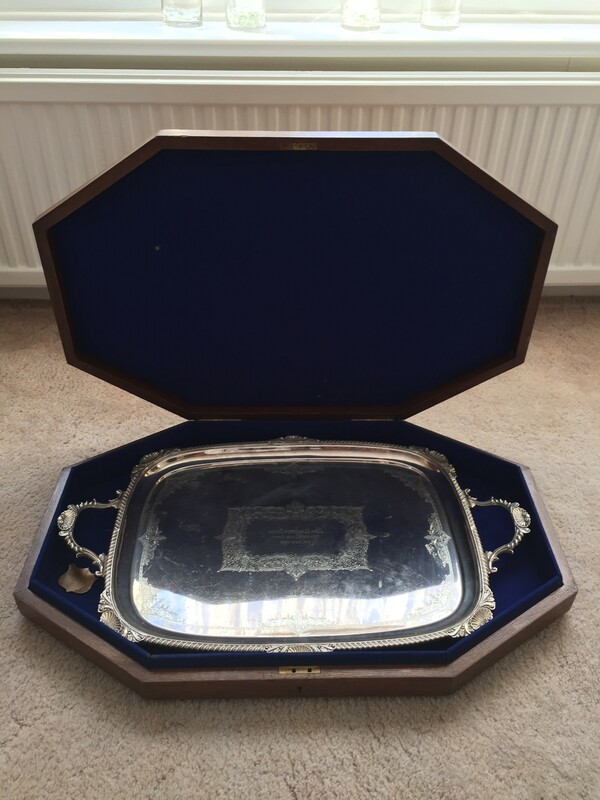 When she left her role as County Organiser, she was given an engraved tray. other activities taking place in the area. ‘It is perhaps a little unfair to set every well-meaning Rep down as “Lady Blimp,” but let us at least recognise that some divergence of point of view must inevitably arise between the staid squirearchy of middle-age, and gay wild youth out for all the fun it can get’. Vita Sackville-West, ‘Women’s Land Army’, p. 17. 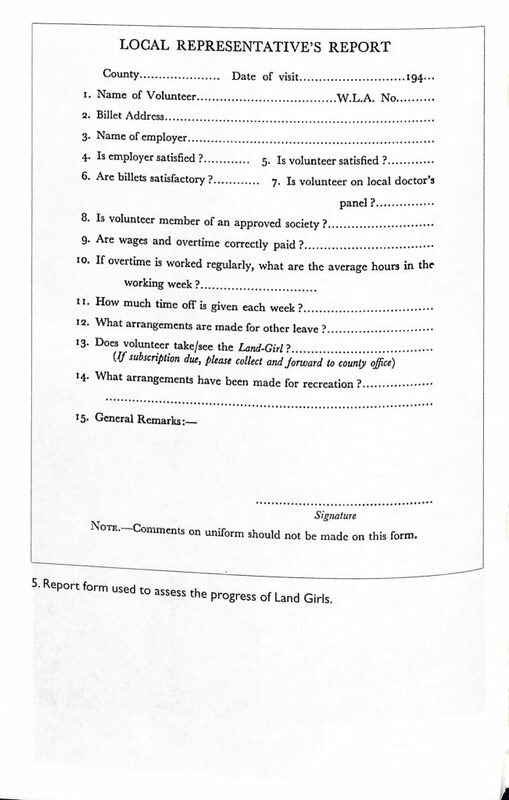 The form, filled in by local Reps, to report on the progress of individual Land Girls, to share with the county office. A list of all the Chairmen and County Secretaries, published in The WLA Handbook. Kramer, Ann. Land Girls and Their Impact. Barnsley: Remember When, 2008, p. 107. Sackville-West, Vita. The Women’s Land Army. London: M. Joseph, 1944, pp. 14-15, 17, 21. Shewell-Cooper, W. E. Land Girl: A Manual for Volunteers in the Women’s Land Army. Stroud: Amberley, 2011. Tillett, Iris. Cinderella Army: Women’s Land Army in Norfolk, 1988, pp. 5, 21.